Arizona guard Lucia Alonso (4) muscles her way past Long Beach State guard Ma’Ohi Berry (0) and to a score in their game at McKale Center, Tuesday November 28, 2017, Tucson, Ariz.
UA guard Lucia Alonso during Iona at University of Arizona women’s basketball at McKale Center, Tucson, on Nov. 10, 2017. Point guards. They are coaches on the floor, the quarterbacks. They bring the ball down the court and run the offense. Yet, there is so much more to this position than meets the eye. The “1,” as it is called, must possess great communication, passing and ball-handling skills, and must know their teammates’ strengths. Point guards must also make the right decisions at the right time, be creative when a play breaks down, know when to pass and when to take their own shot, see the court and what is unfolding, and anticipate. “Point guard is the most important position on the floor,” said Arizona women’s coach Adia Barnes, whose team will face Southern Utah at 7 p.m. Wednesday. “She is the coach’s voice and responsible for the organization of the offense. She knows her position and everyone else’s and where they should be. “People think, ‘Why doesn’t she look for her shot?’ But she is looking for the best shot for the team. The other night, (point guard) Lucia (Alonso) kept hitting her shot — that’s because it was the best for the team. She is the playmaker and knows what it looks like. 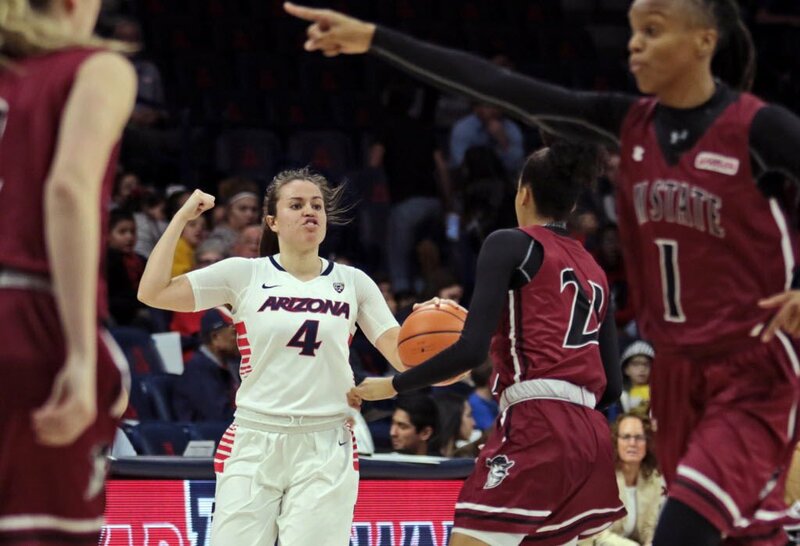 Alonso, a sophomore, runs point for the Arizona women’s basketball team, something she’s done from her very first game as a Wildcat. In her first career start, Alonso finished with 10 points, six assists, four rebounds and one steal, and had only three turnovers. Point guard play, Alonso says, comes down to two C’s: control and communication. This role of point guard has changed throughout the years. Point guards used to be pass-first players, although some — like Bob Cousy, Oscar Robertson and Magic Johnson — could do it all. Johnson brought the role of point guard to the next level. He was big, yet he could run the fast break, dished out perfect passes and could defend any position. These days, the point role has evolved even more, into a hybrid of a shooting and passing guard. Players like Stephen Curry, James Harden, Kyrie Irving, Diana Taurasi, and Kelsey Plum do both well. “Years ago, smaller players were at point and they had to pass first,” Barnes said. “They always had to be smart, but now they have to be more versatile, powerful and taller at this level and in the pros. The game changed with unconventional players like Diana Taurasi and Kelsey Plum. Diana is running the offense, a player who can play a 1, 2, or 3, at 5 feet 11 inches. She’s powerful, smart and can post up. Kelsey is a dynamic scorer, averaging 20 points per game. She changed the game as a scoring point guard. Barnes never played point guard, but understands the complexity of the position. She shared the court with Sue Bird, considered by many to be the greatest point guard in WNBA history. Bird, a 10-time WNBA All-Star, two-time WNBA champion and four-time Olympic champion, plays for the Seattle Storm and is the WNBA career assists leader with 2,610. She can beat you with her shot, too: Bird averages 12.2 points per game over her career. Bird has influenced how Barnes coaches her point guards. She teaches them to be more vocal and about the assist-to-turnover ratio. That stat meant the most to Bird. 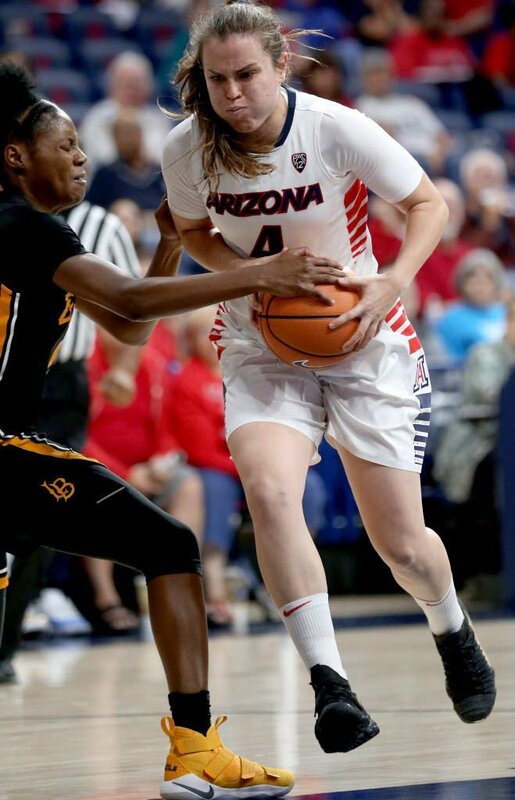 Alonso, Arizona’s point guard, has seen a drastic uptick in her numbers over the last six games. Alonso has 22 assists to six turnovers in that span, a ratio of 3.67. Some perspective: Bird has averaged a 2.2 over her entire professional career. Alonso’s game improved with a summer of playing for Spain’s U19 national team in the World Cup. As a captain of the team, she averaged 6 points, 2.3 rebounds and 2 assists per game. She also shot 46 percent from the field. Alonso’s numbers show how her international experience has helped her game. Alonso has 21 steals this season after finishing her freshman year with just 28. Alonso has 39 assists this season and is on pace to smash the 73 she had all last year. She’s shooting an even 50 percent from 3-point range, up from 43 percent a year ago. She has 23 rebounds already this season, after finishing last year with 55. Alonso’s coaches say she is calm and doesn’t get rattled — something she shares with Bird, her favorite player. Add one more to the list of must-haves for a point guard: toughness. Former Minnesota high school star returned from injury to join UA roster.